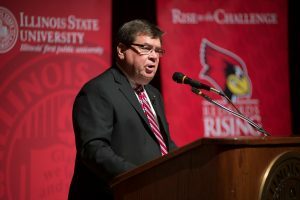 Illinois State University is part of a new nationwide effort to increase college access, close the achievement gap, and award hundreds of thousands more college degrees by 2025. The initiative, known as Powered by Publics: Scaling Student Success, is organized by The Association of Public and Land-grant Universities (APLU) and brings together 130 public universities and systems. The participating institutions will work within clusters of four to 12 institutions to implement innovative and effective practices to advance student success on their campuses. Collectively, the institutions enroll 3 million students, including 1 million students who receive Pell Grants for financial assistance. Illinois State, along with peer institutions within its cluster, will focus efforts to enhance student retention. Each university will share successful practices for monitoring student academic progress and providing increased support for those at risk of failure. Student retention best practices will also be shared with all the universities within the Powered by Publics initiative. Powered by Publics represents the largest-ever collaborative effort to improve college access, advance equity, and increase college degrees awarded. In addition to committing to those goals, participating institutions have pledged to share aggregate data demonstrating their progress to spur lasting change across the higher education sector. The university clusters will concentrate on different aspects of student success. Focus areas will also include financial aid and student financial literacy, and a deeper integration of career advising to speed degree completion and workforce preparation. By design, the participating universities reflect a wide array of institutional characteristics such as enrollment, student demographics, regional workforce needs, and selectivity. The broad diversity of the institutions is intended to help create a playbook of adaptable student success reforms that can be adopted and scaled up across a variety of institution types, including those with limited resources. The effort is overseen by APLU’s Center for Public University Transformation, which the association created this year to help drive transformational change across the public higher education sector.